Don’t like ricotta cheese? No problem, because this recipe for stuffed shells doesn’t use any! Personally, I don’t mind a little ricotta but for those that do this recipe is perfect. Instead of just using cheese, a generous amount of ground beef is going into these shells as well (yummy!). I made this last night and needless to say, they were all gone very quickly. What’s great about this recipe is the sauce, adding a little red wine to the sauce gives it just the right amount of kick. 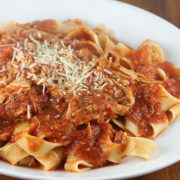 I know once again I’m using store bought sauce, but I will post a great recipe for pasta sauce on this blog in the near future. There is nothing about this recipe that is very hard, there may be a few ingredients but the part that takes the most time is stuffing the shells I think. If you are making a lot you might want to get an extra hand for the stuffing part, but regardless the recipe is very simple and won’t take long at all to prepare a great meal. Oh yeah, and serving with garlic bread is a must. I have submitted this recipe to Kevin at Closet Cooking who is hosting this weeks Presto Pasta Nights. Step 1: Cook shells according to package directions. Meanwhile in a pan brown ground beef, garlic and onion. Drain off any excess fat and let cool. Preheat the oven to 400 degrees. Step 2: Combine meat, mozzarella cheese, egg, breadcrumbs, chopped parsley and season with salt and pepper. Step 3: Mix spaghetti and tomato sauce and pour of the bottom of a 13×9 inch oven safe dish covering the bottom with a quarter of the sauce. Step 4: Stuff the cooked and drained pasta shells with the meat mixture and place on top of the sauce in the oven dish. Add red wine and the remaining sauce mixing well and pour over the top of the shells. Sprinkle with parmesan cheese. Step 5: Bake in the oven for 20-25 minutes. shells stuffed with cheese usually don’t satisfy me–there’s always something missing. i’m a carnivore, for crying out loud–gimme meat! this is a great and good-looking recipe for us meat-lovers! this is fantastic! jumbo shells are great. this makes me think of a giant raviolli 🙂 and i have to say i love ricotta. in pancakes, in cheese sauces for musaka but i’m not too big a fan of meat so i might go the opposite and go for a cheese spinach stuffing. either way, this is fantastic my friend. i’m hungry now. grace – thanks, I love the ground beef as well! This recipe really is great. Those stuffed shells look great! The photos are nice! What vibrant reds and greens! I like the meat stuffing. Thanks for sharing with Presto Pasta Nights! Kevin – haha, I had to put that macro to good use. I’m looking forward to when the event is posted! I’ve always loved baked pasta shells. Yours look awesome. Gorgeous photos on all your posts, btw. Thanks for sharing with Presto Pasta Nights. I do hope to see you there often. Ruth – Thanks for the compliments on my photos. I look forward to many more Presto Pasta Nights! I just made these last night – minor changes, I added fresh spinach to the top of the meat, then parm, then sauce and then mozza. We all loved them, they will be a regular dish here – I took pics and will blog about them soon and link back here. This recipe sounds (and looks) delicious! I’m printing now and going to test it out this weekend when I have a little extra time. Thanks! Chef Tom – Great, I hope you enjoy it. Let me know how it turns out. I’m trying this recipe out this weekend for my boyfriend. I can’t wait! It looks so delicious. This looks fabulous and I bet red wine steps it up a notch. Question for you, if you must cheat and buy a premade sauce, do you have a favorite? Heidi – haha, idunno, I normally use ragu. The red wine will enhance any sauce. Let me know how it turns out. I made this tonight and it is by far the best stuffed shells recipe I have ever come across. Soo soo good! Thanks. I made this last summer but failed to come back and post the blog entry – am reposting it today so here you go! Thank you. The recipe is great….I did add just a little left over Italian Sausage and it was super good. The ingredients say spaghetti sauce, but it is okay if I substitute pasta sauce? Or are those the same thing? This seems delicious! Just 1 thing, do i have to use red wine? is there any alternatives, or can i just drop that ingredient. Thanks! I was thinking of trying this recipe but replacing the ground beef with italian sausage(I eat pasta with beef every other day). What do you think? I haven’t tried italian sausage before. Dominique – I think it would taste great, go for it! What a great recipe you saved me! Unexpected quests for dinner. I always have cooked pasta and ground sirloin in freezer for emergencies. So good thank you! pam- I would say this should serve 2-4. It will make about 18 shells or more.